Smove Paradise is one of those few brilliant arcade games that turn a really simple idea in a total blast. Your character is placed on an area with 9 tiles. All you have to do is to pick up the coins and the diamonds that are placed on the tiles. Oh and of course you have to avoid by that red dots that inconveniently fly all over the place. To avoid these collisions it is not enough to show lightning fast reflexes, but you also need plan ahead on which tile to jump next.The coins you find can be used to continue the game after a collsion or to buy new characters to play with. 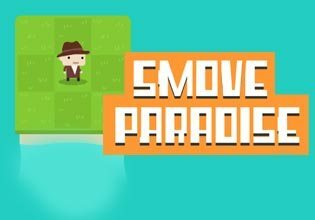 Play Smove Paradise now for free!